Reviewing products is an undeniable plus point about being a blogger and what is more enjoyable but a huge box of crisps to try out? A week or so ago I took in a surprise delivery. Ethan jumped on me before the postie had even left the front door. He knows there's a good chance that items being delivered are effectively "for him" (who doesn't get more pleasure and less guilt about buying things for their children instead of them?!). On this occasion though, it was something for the whole family to try out. Well, not Felix, I might be a slack mother on occasion but he's only 3 months old, I'm not about to feed him crisps! 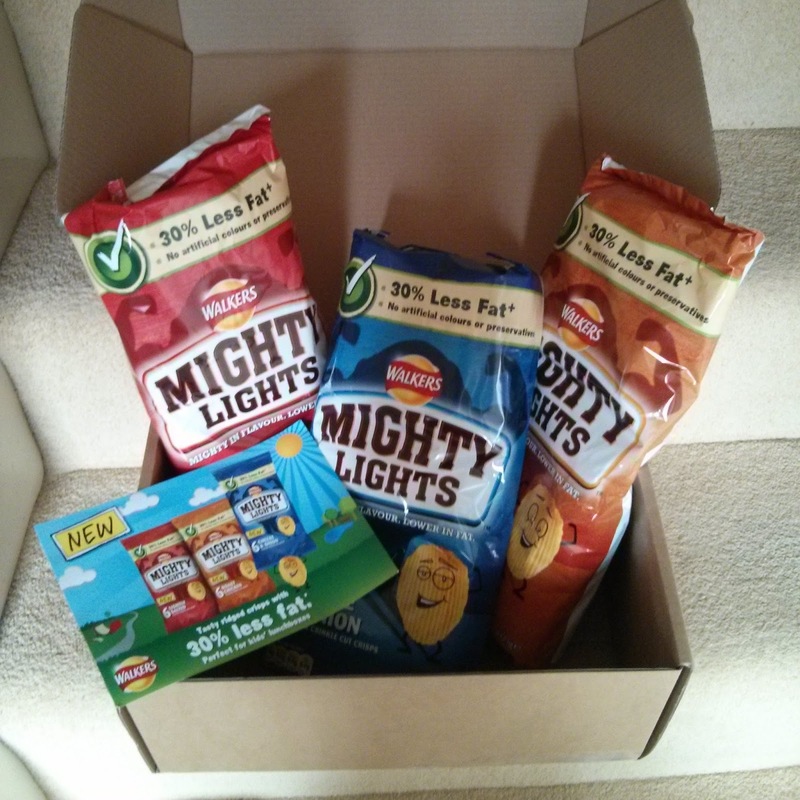 Yes, a lovely box of free crisps! Yay! It wasn't even 9am but I hadn't had breakfast and the baby was screaming, so I decided to indulge myself straight away with a packet of roast chicken flavoured crisps and very tasty they were! Mighty Lights are a new range of crisps by snack giant Walkers. The idea is a tasty fibre filled snack that is 30% lower in fat than normal crisps. I'm not generally a fan of "diet" crisps, but I'm always happy to try out a new snack! I have to say that I really enjoyed the "non fatty" feeling of the crisps. They were dry and crunchy but in a good satisfying way. Some crisps feel too oily to me - these were just right! There was a decent amount of flavour, I think the ridge effect helps with this, trapping more taste! Mighty Lights are available in three flavours, Ready Salted, Roast Chicken and Cheese & Onion and all flavours are suitable for vegetarians. I would have liked a Salt & Vinegar, that's my favourite flavour, but I have to say the Roast Chicken flavour is good and the Cheese & Onion flavour tasty but not too onion-y and overpowering (i.e. your breath doesn't stink of onion for the remainder of the day). A key point with these crisps is that they have a lower fat content, are made from real potatoes with no artificial colours or preservatives and are a source of fibre and Walkers would like to know if I'd be happy to put them in my child's lunchbox. Well, I would have to say yes. I have already in fact. Ethan has tried all three flavours and declared them "yummy!". 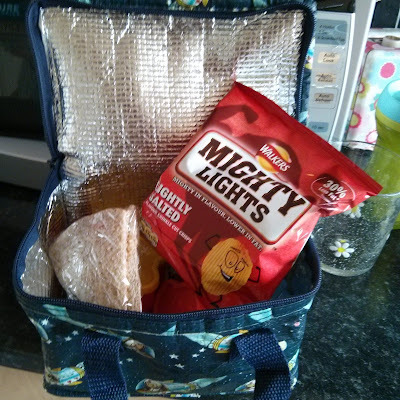 I don't think I'd put them in every day, crisps are still a treat in my book and I like Ethan to have a variety of items in his lunch box. I'm not opposed to him having crisps though and I do like the fact these aren't as full of fat. Are we sold on Mighty Lights? I think so! Tasty and not so fatty, I've enjoyed them, Ethan LOVES them and hubby said "they're pretty good!" (which is good coming from him on the subject of crisps!!). Even my aunt gave them a try and enjoyed the flavour!